How this came about: Since we began the Floating Empire project, one of our main goals has been to take the whole thing as far off grid as possible, to use little or no fossil fuels and to operate with as much self sufficiency as possible. In that regard, we produce the bulk of our power from solar, process our own water, and, in general, try to live as lightly on the planet as we can. But heating and cooking was one area where we were less than green. Admittedly, using our kerosene stove and heater used very little fuel, but it's still a fossil fuel. 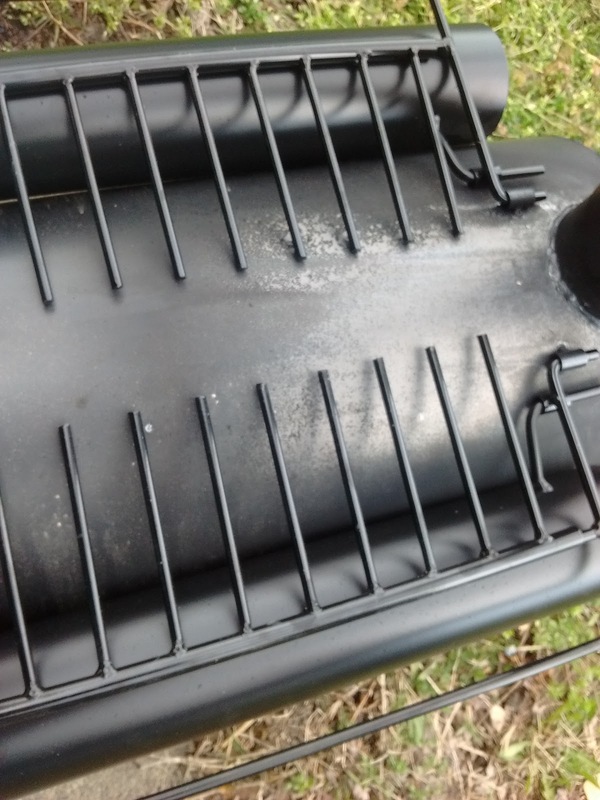 We looked at a number of other options, but kept coming back to wood and charcoal as a greener option for heating and cooking. Our original design had an open hearth where we could actually have a small fire, but we never really used it. But finally the expense, smell, and inconvenience of kerosene kind of got to us. 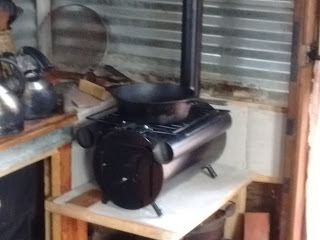 We began to re-address solid fuel stoves as an option. There is quite a bit of deadfall hereabouts, and a lot of our Marina neighbors are in construction, so there would probably be a ready source of small, dry wood. Here's the problem: Woodstoves, particularly for vessels, are expensive, and each has their own eccentricities. Prices ranged from around $260 for the Fatsco stoves to well over a thousand for other makes. We were leery of making the investment if we didn't know if we could live with wood as a cooksource. 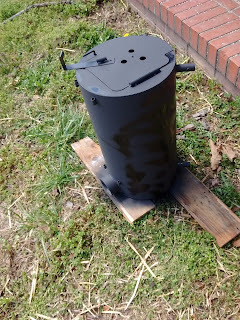 So we, like all good Americans, went directly to the internet and found the cheapest possible wood stoves. These are barrel stoves intended for tents, and, on one level, Floating Empire is just a big tent. We found a Chinese (of course) version for less than $100 which included a stainless steel water jacket, so we went for it. If we liked it, we could always upgrade. If not, we'd not be out much. 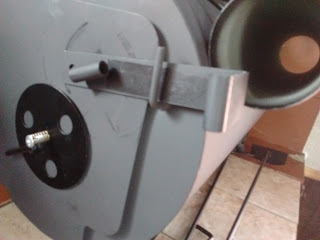 The rather ubiquitous one we found is marketed in the US by TMS, and generally advertised as : TMS® Portable Military Camping Wood Cooking Ice Fishing Cook Stove Tent Heater With Water Kettle Teapot. Okay, lets get real. This thing is a long way from military grade. It's a cheap stove made from sheet metal, apparently recycled sheet metal, with iffy welds, bad paint, and meh fitting parts. The price, was, however, right, so we gave it a whack. Checking for size. We modified the galley to accommodate the little beast. Okay, first the bad news. Everything you've read about the fit and the paint on this thing is true. 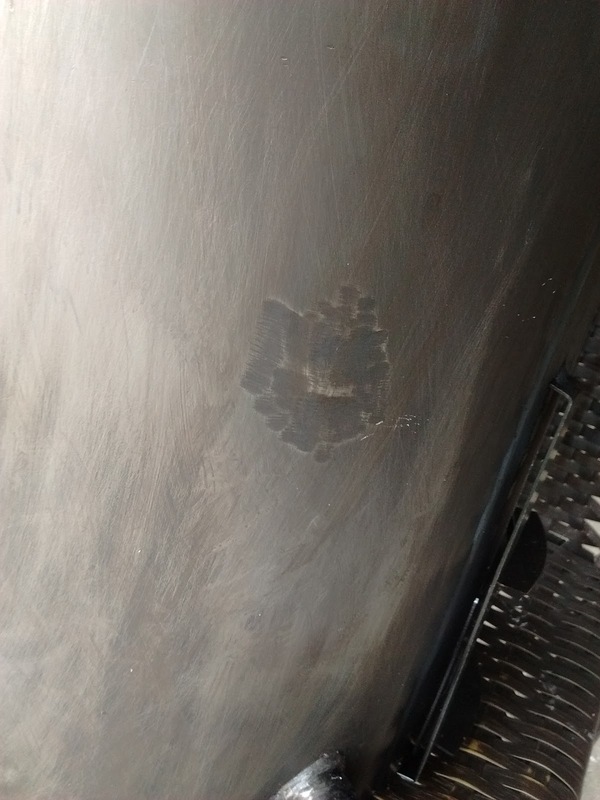 The stove comes with a glossy coat of what appears to be automotive paint. With the first firing, 90% of the paint simply fell off. Revealing numerous welded patches in the metal, most pretty well done. We had been warned of this by numerous reviews, so if you get one of these do NOT do your first couple of burns inside unless you like burning paint fumes and smoke (If you DO like breathing paint fumes, I recommend repeatedly telling yourself that the bunnies are not real). As it was, one three-hour burn took enough of the paint off that it was possible to sand the rest off in only about twenty minutes. A couple of coats of high-heat woodstove paint and we're good to go. The second thing is the construction: While the machine welds along the cylinder of the stove body are precise, anything done by hand is sloppy. One reviewer commented that they looked like they were done by a bored teenager on some factory floor, and that's not too far from the truth. Some of the design ideas are just plain odd. The door, in particular, is kind of odd. There is no provision for a gasket, and the catch is, well, puzzling. I mean, what the heck is this supposed to be? The catch is a tube, welded to a screw, through which a piece of bent rod stock slides. Why? It's almost impossible to engage when the stove is hot. 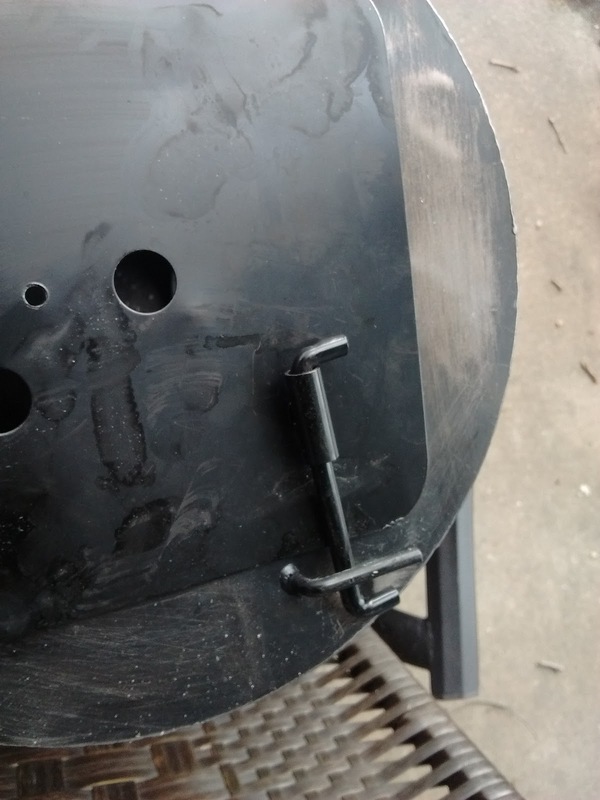 Like most folks, I replaced it with a piece of flat steel, which works pretty well. This works much better as a catch. Not sure why they didn't do it this way in the first place. There is, of course, some good news: The air control vents are spring loaded and work well, and, though it isn't mentioned, they are on both the front and back of the stove, giving you a fair amount of control. There is also an ash dump in the back with a sliding hatch, which also isn't mentioned. The stove pipe is HEAVY. Actually, I think it's probably automotive exhaust pipe, but it does the job. The rack with the two circulation tubes fit well on our stove and do their job. Probably worth more than the stove. Unlike the stove, it's a precisely shaped and welded piece of stainless steel with a metal valve assembly. 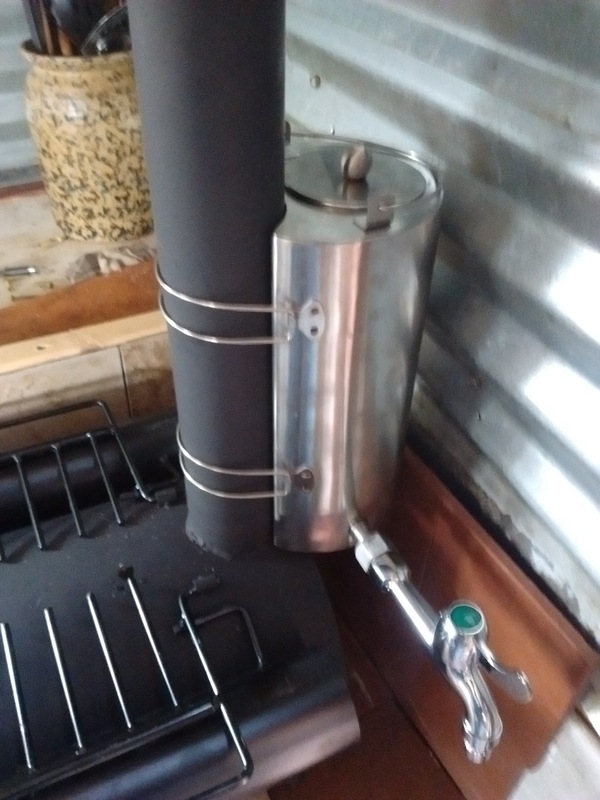 Probably cost more to make than the stove, but heats water quickly (it holds about 2.5 L), and is gonna be handy. In order to create a space for the stove, we extended the stepped hearth we had built for the kero stove and lined the whole thing with concrete board, then with tile to handle the heat. 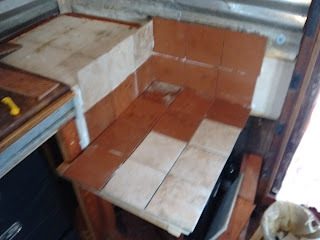 Tile and concrete board going in place. We've used the stove a few days now, cooking on it last night...okay, we boiled water... and using it for heat (we've had a bit of a cold snap lately), and it seems to work fairly well. 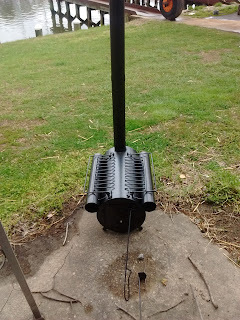 We'll be needing to extend the chimney (air from a north wind compresses air against the front of the boat and backdrafts the stove a bit) and doing some prettification on the stove platform, but thus far, so good. We'll be giving you an update as we experiment with this little tin can. More stuff at Life, Art, Water, and over at Wild Shore Press. Give em a look. I've enjoyed reading about the Floating Empire ever since I happened upon an article in shantyboatliving.com, when you folks were first building her. What you are doing reminds me of the Latsch Island boathouse community in Winona, MN. (http://www.abitare.it/en/archive/2011/11/29/floating-winona/) I live in St Paul and love the Mississippi river and all the little river towns along her banks up here. I try to visit Latsch Island at least once a summer. Just want to say, well done, folks! Well done. Thanks so much. I'll check that link out. Nice review. Where are you planning your fuel storage? I wouldn't think you would have much space aboard. Or would you forage for it each day? Why we live here. . . . This Wind. . . .